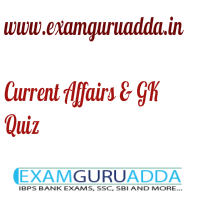 Dear Readers Examguruadda.in presents Current Affairs Quiz Questions and Answers of 25-26 February 2017 that cover important current affair events. Current Affairs quiz for IBPS PO,clerk, RRB-Po,Clerk, SBI, NIACL,Railways and SSC Exams. 1. The Andhra Pradesh government has signed MoU with which payment network company to transform Vishakhapatnam into India’s first ‘less cash’ city? 2. John-John Dohmen, who has won the International Hockey Federation (FIH) Male Player of the Year 2016, is belonged to which country? 3. Which city is hosting the 2017 Mobile World Congress (MWC)? 4. Who is the author of the book “Kohinoor: The Story of the World’s Most Infamous Diamond”? 5. Who has been awarded the 2016 Indian Entrepreneur of the Year (EOY) Award by the firm Ernst & Young (EY)? 6. Which Indian sportsperson will represent IOC’s Athletes’ Commission (AC) in the Badminton World Federation (BWF)? 7. Which movie has won the Best Picture award at 89th Oscar Academy Awards? 8. India’s first hill station bicycle path has opened in which state? 9. Which hockey team has won the 5th edition of Coal India Hockey India League (HIL) 2017 tournament? 10. Which state government has launched India’s first post office passport service center?